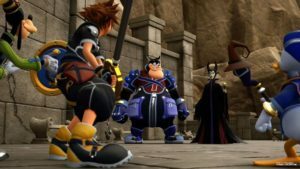 After 13 years of waiting, Square Enix has finally released Kingdom Hearts III. Available for PlayStation 4 and Xbox One, the third installation of the Kingdom Hearts franchise sees protagonist Sora and his friends embark on a perilous adventure. The game makes use of the vast array of Disney and Pixar worlds to flesh out its story. In this Kingdom Hearts installation, Sora is joined Donald Duck and Goofy. Their goal is to stop an evil force known as the Heartless from invading and overtaking the universe. Throughout the game, the group will unite with iconic Disney-Pixar characters from Toy Story, Monsters, Inc., Big Hero 6, Tangled, Hercules, and more to overcome challenges. The Kingdom Hearts III has a suggested retail price of P3,099 for the Standard Edition and P4,399 for the Deluxe Edition.